Ye Olde Mouse House cheese shop has opened at 34 Steep Hill, Lincoln. Property owners Taylor Lindsey have let the property to Erika Grinstead and her daughter, Mollie Haines. 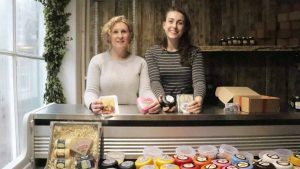 The family business will sell a range of cheeses, including Skegness blue and Lincolnshire brie. The proprietors have close connections to the Skegness-based Lymn Bank Farm brand and will be selling a range of its cheeses including the famous charcoal cheese. A coffee bar is to be opened alongside the cheese shop shortly. Adrian Bower Estate Manager at Taylor Lindsey, commented: “We are very pleased that Ye Olde Mouse House decided to take the shop on Steep Hill, the company offers something new and different that will complement the area”.